Unlike any pulse taking class taught in school, this highly efficient system allows you to diagnose TCM syndromes and western biomedical conditions solely by pulse within seconds! Elevate both your clinical efficacy and patient confidence with every course you take. Start today! 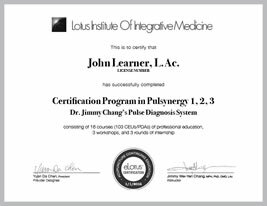 To begin mastering Dr. Chang’s pulse system, start with the beginner level courses and work your way up to the advanced level courses. You may take as many individual courses from the certificate program as you wish, but will only receive an official certificate once all requirements and the exit examination are completed. There is no certification registration or fee to participate in the program other than the cost of individual courses, workshops, internship, and the exit examination ($150). For the best value, we recommend the eLotus Gold Pass, with which you can take all the required courses, plus any other webinars and online courses you want to take. Candidate MUST be a current licensed Acupuncturist or Herbalist to participate. In this workshop, you will see first-hand how Dr. Chang’s highly efficient pulse-diagnosis system will allow you to, within seconds, diagnose TCM syndromes and western biomedical conditions solely by pulse! The day begins with Dr. Chang taking the pulse of each participant thoroughly just like he does in his clinic. In the afternoon, each participant proceeds to practice pulse taking on each other. This workshop can be taken at any level, but we highly recommend that you take the beginner level courses beforehand. To intern ($240/day), send an email to internwithjimmy@gmail.com. Dr. Chang requires that you finish all 3 levels of required courses before making an appointment to intern at his clinic. This way you can fully understand his terminology, style of practice, and get the most benefit from your internship. The examination will be activated after a review and verification period of 2 weeks. Once verification is completed, you will be notified via email on how to take the exit examination. The examination consists of 100 multiple-choice questions with a passing score of 90% or 90 questions correctly answered. You will have two hours to complete the examination. The examination fee is $150. Each examination fee allows the candidate two attempts to pass the exam. Correct answers will not display at the end of the examination. How long does it take to truly master Dr. Chang’s pulse system? Generally, it takes about 2-3 years. In the beginning, it may be challenging to learn a new system and let go of what was taught in TCM school. However, do not be discouraged as your fingers take time to develop sensitivity for the subtle differences in the pulse. The more pulses that you feel, the quicker you learn. Dr. Chang always says that once you feel the correct pulse for a biomedical condition, you will never forget it. What is the best way to grasp and understand Dr. Chang’s pulse system? By watching the videos repeatedly. Students have reported that after a year of learning by watching the videos, they experience an immense breakthrough as everything starts to make perfect sense. When you are ready for in-person learning, join us at the Hands-On Pulse Taking Workshop, which can be taken at anytime and at any level you are – beginner, intermediate, or advanced. The last step is to intern with Dr. Chang in his office to expand and deepen your learning even more. Dr. Chang’s wish is to see more practitioners become TCM artists and carry on the pulse taking tradition for generations. The skill that you acquire will surely expand your practice and help more people. “Dr. Chang is a master and that is so rare to have somebody who is willing to show how they systematize their process of diagnosis and prescription process. My clinical results have improved tremendously since I started using Pulsynergy two years ago. And, the audio recordings of the Pulsynergy 1,2,3 were super helpful for reviewing the information for the Pulsynergy video courses. There is so much to learn and I have listened to those lectures over and over again.” - Scott B. “Master Chang’s presentation on [Case Studies: Clinical Discussion on Pulse Diagnosis and Herbal Prescriptions] was an insightful peek into a brilliant herbalist’s mind. I have a deeper understanding from watching him go through his patient’s treatment protocol on how to approach a diagnosis and treatment plan to best serve my patients. I appreciate the great gift given to us that day. Master Chang was completely selfless and generous in sharing such intimate information. I am still digesting his presentation and it has helped me in having a better understanding of the big picture. I hope he knows how much we appreciate him. Please consider presenting a similar seminar again soon. Thank you.” - D.G. “I just wanted to thank [eLotus] for being around. It’s so exciting to have a place where I can keep up on learning new things on a career I’m very passionate about. Thank you for making it possible. Please don’t go away! Please keep Dr. Chang’s webinars around. I love them!” -H.S.